A small village high up in the hills above Marbella, Benahavis shouldn’t by rights be a reference point for where to eat well in Malaga Province. But for years now, in-the-know foodies have been winding their way up the mountain roads from the coast to get a place at the so-called ‘Dining Room of the Costa del Sol’. 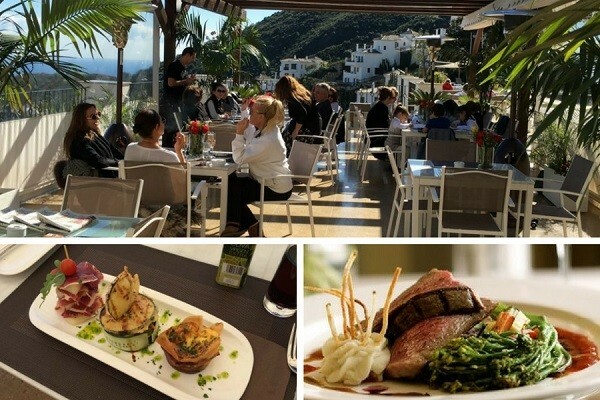 Here are just a few of our favourite Benahavis restaurants to help you explore some of the best eating and drinking that the area has to offer. Los Abanicos has been one of the go-to restaurants in Benahavis for years now, as much because of the feel of the place as anything else. From the super-warm welcome and a (highly recommended) large G&T on arrival, to the strings of garlic and sun-dried peppers that hang from thick wooden beams decorated with brightly coloured fans, it’s just got a lovely atmosphere. That’s not to say that the food isn’t great, though. While it’s not fussy or remotely ‘haute’, it focuses on great ingredients, strong, simple techniques and portion sizes that mean you don’t need to eat again that day. Baby squid, steaks as thick as bricks (although a little juicier), and tender, slow-cooked suckling lamb are all highlights. Address: Calle Malaga, 17, 29679 Benahavis, Malaga; Tel. +34 952 85 50 22. Tucked away within the hotel of the same name, this restaurant has been serving up some of the best food in Benahavis for over a decade now. Like the hotel itself, the décor is personal and eclectic with polished terracotta floors, evocative low lighting, mixed tables and chairs and interesting artworks on the walls. Food-wise, the menu tends to be a small but select affair. You can expect the likes of pan-fried seabass, red tuna and a handful of barbecued meats, depending on the season and availability at the market. The one thing that’s absolutely not to be missed, however, is the pan-fried foie gras – a speciality of the house. Address: Calle Pilar 3, 29679 Benahavis, Spain; Tel. +34 952 85 60 26; Amanhavis.com. The café of the Benahavis Hills Country Club strikes a nice balance between a relaxed vibe and serious food. On the one hand, head chef Jean Francois Job comes with some pretty serious pedigree, having cut his teeth in the Michelin-starred kitchens of greats like Roger Vergé and Alain Ducasse. On the other hand, there’s a gorgeous terrace from where, in the evenings, you can settle in with a drink and enjoy the views of the twinkling lights of the costa… and Morocco beyond. The food itself can keep you guessing, as it varies enormously depending on which day you drop in. On Saturdays you can expect ‘rijsttafel’, a Dutch take on Indonesian small plates, Sundays are all about roast lunches, and during the week there’s an Asian-influenced a la carte menu to choose from. Address: Sector la Coja, s/n, 29679 Benahavis, Malaga; Tel. +34 952 856 171; Benahavishills.com. Not a restaurant in the traditional sense of the word, you have to limit your visits to this hospitality school to Monday-Friday 1330-1500 as it isn’t open on evenings or weekends. But it’s well worth the minor inconvenience, as this little gem to the north of the village is one of the best places to eat in Benahavis. It’s also extremely good value, with menus paired with wines available on Mondays and Wednesdays for €29 and tasting menus on Tuesdays, Thursdays and Fridays from €38. It’s impossible to make a recommendation, as the menu – and indeed the chefs – change depending on what’s fresh and seasonal, and what the students of the school are covering in their course at the time of your visit. Address: Avenida de Andalucia 23, 29670 Benahavis; Tel. +34 952 855 242. Escuelahosteleria.es. Dining in Argentina is about the simple things done really well. And this little slice of the Pampas on the way up from Estepona to Benahavis could hardly demonstrate that more clearly. What to order? You can’t really go wrong with a Chateaubriand washed down with a nice bottle of Mendoza Malbec – and if you’re feeling particularly hungry some lamb empanadas to start off with. Simple things. Done really well. Address: Km 1.5, Carretera Benahavis, 29688 Estepona, Malaga; Tel. +34 952 88 37 42; Tehuelche.net. ‘Typically Andalucian’ is how you’d sum up the appeal of this family-owned old favourite. You’re met with real warmth by the owner, Manolo, who’ll often proceed to roll out a magic trick or two for any children in the group. The menu is full of simple southern Spanish staples – from gambas al pil pil (spicy prawns) to gazpacho via suckling pig – served against a typical and pleasingly lively backdrop. Is it going to win any Michelin stars any time soon? It’s unlikely. Is it one of the most inviting places to eat in Benahavis? Without a doubt. Like this pick of the best Benahavis restaurants? Book a foodie break with a stay at one of our nearby luxury villas. If you’re planning a gourmet trip to the town, and want to reserve your place at the best table in the house, contact our concierge.